Children are a heritage from the Lord, offspring a reward from him.~ Ps. 127:3: !Kya Reads Her First Book! 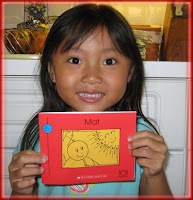 !Kya Reads Her First Book! I can't tell you how excited I am. Kya has been reading words up to 4 letters for months now. We can occasionally get her to concentrate long enough to read an entire sentence, 2 sentences maybe if we wait long enough and offer a reward. But a book?! Forget it! She does not want to sit long enough to try and read a book, no matter how small. Of course she loves us to read to HER, it's HER reading to us that is the issue. It's just too much work when there is so much playing to be done. Yesterday, June 3rd, was the day though that Kya declared she was ready to read a book. We sat down on the sofa, picked up the 1st of the BOB books, knowing she could read all the words, and she did it. She completed the book. That night at dinner, she stood up and read the book to the family. Today we captured it on a 40 second video. Remember to turn off the playlist music before starting videos.